The genesis of Copeland Furniture began in the mid 1970’s. That’s when Tim Copeland left his job in wholesale lumber sales to make cider presses in his father-in-law’s garage in East Corinth, Vermont. The cider presses were sold through a mail order catalog for personal and small orchard use. From these humble beginnings, Tim grew his one-man business into the largest employer in Bradford, VT where his quality hardwood furniture is produced and shipped throughout the U.S. every week. With the addition of Tim’s son Ben and grandson Isaac, three generations of Copelands now take pride in producing furniture that will be handed down to future generations for years of use and enjoyment. 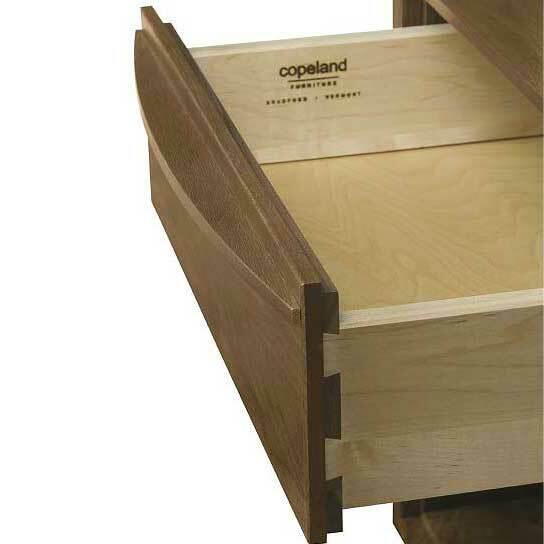 Copeland’s 3/4″ thick solid wood drawer fronts are attached directly to the 5/8″ thick solid drawer sides using asymmetrical English dovetails. The drawer sides and back are solid cherry, maple or ash depending on the collection. The drawer boxes are sanded, feature soft chamfered edges and are protected with a catalyzed lacquer. 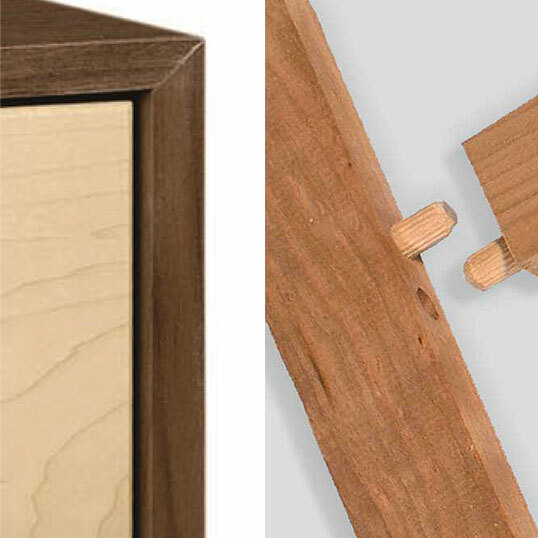 Transitional styles feature a frame and panel construction with interlocking, glued framing members. 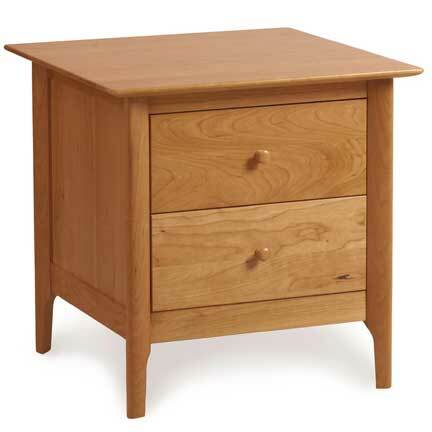 With more modern styles, the solid wood top and sides are joined with a forty-five degree miter joint. The technique to produce this style of case requires extreme precision and is only attainable through exacting detail. The backs of all dressers, chests and cabinets are hardwood plywood that is integrated with the sides and top of the case so that no screws or brads are visible. In the Sarah, Berkeley and Monterey collections, the back features a Cherry or Maple veneer that is finished to match. This allows these collections to float freely in your room with the back exposed if desired. Solid hardwood corner blocks stabilize beds, dressers and chair legs. 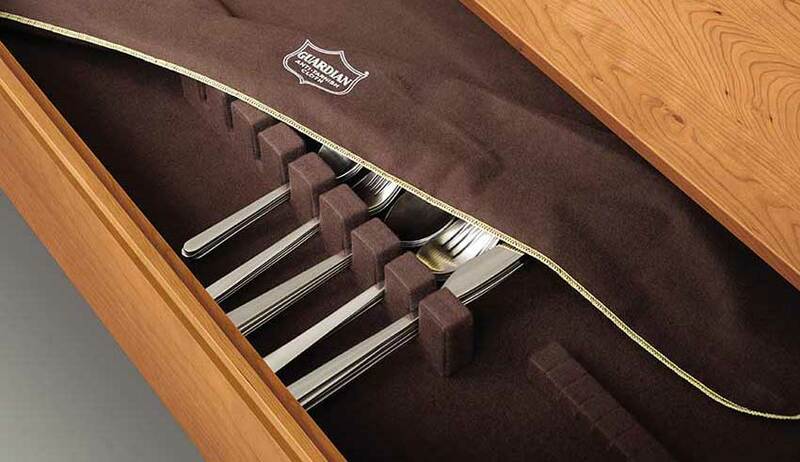 Extension tables feature self-storing, easy-open butterfly leaves. Copeland dining tables are all solid wood and depending on the collection are available in solid Cherry, solid Walnut or solid Ash. Copeland dining room cabinets, buffets and servers feature under mounted drawer glides that close the drawers softly with a gentle push. (Sarah dining cabinets excluded). Buffets and dining cabinets feature heavy duty, hidden hinges that gently close with a light push. Buffets with drawers include one tarnish resistant silverware tray. The tray is removable for storing other items if preferred. 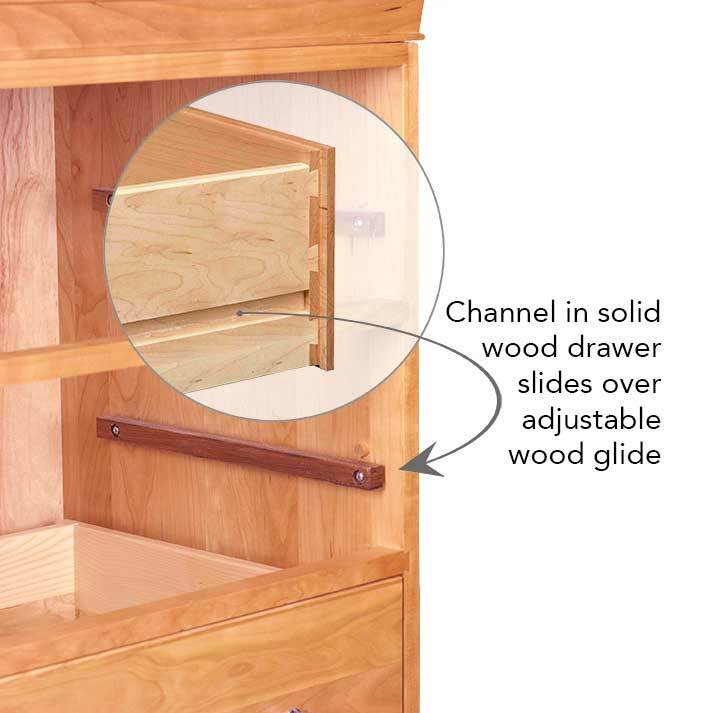 Side-mounted, wood on wood glides is a traditional cabinet maker’s standard. 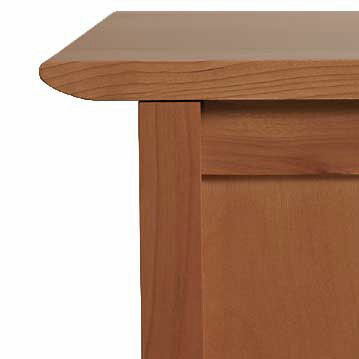 Adjustable wood glides are a unique Copeland Furniture innovation. The glides are spring loaded and attached to the case side with Philips head screws that can be loosened or tightened for smooth operation. 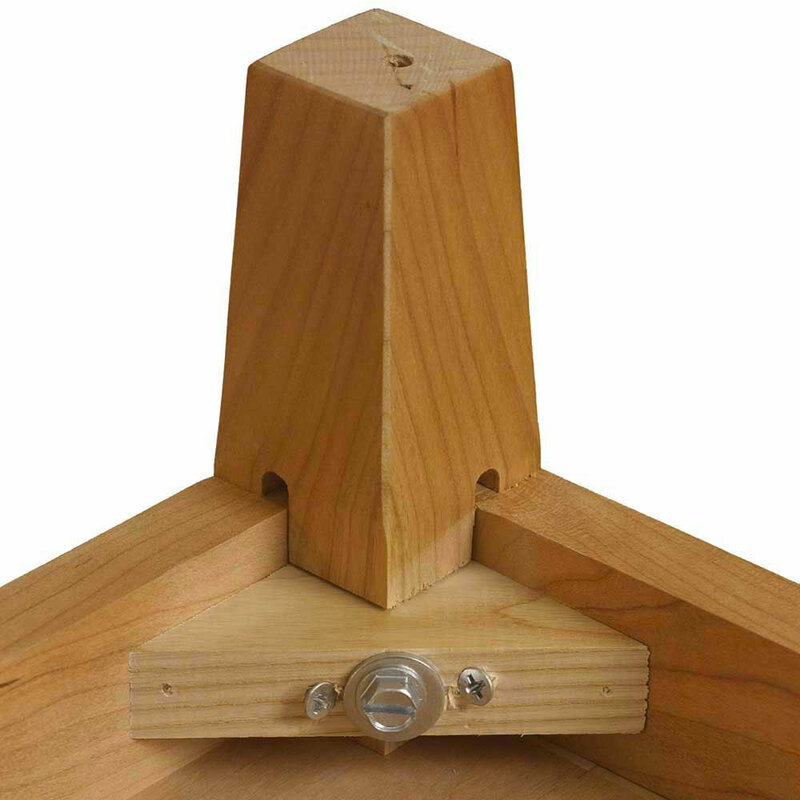 A threaded machine bolt is screwed into an embedded T-nut while two, non-glued wooden dowels align the bed rail with the headboard and foot board. This forces it into proper orientation and prevents twisting. The parts are joined together with a contoured washer and hex nut using the supplied wrench. 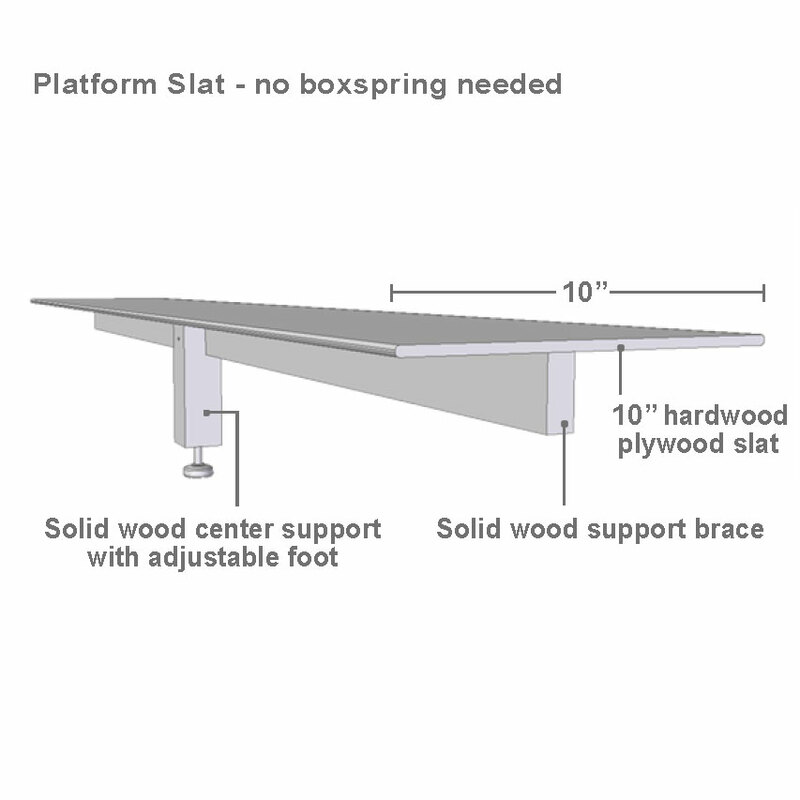 Bed slats consist of a 1/2″ thick hardwood plywood board that is supported by a solid hardwood 3/4″ plank centered under the slat and mounted perpendicular (T-braced) to the slat. 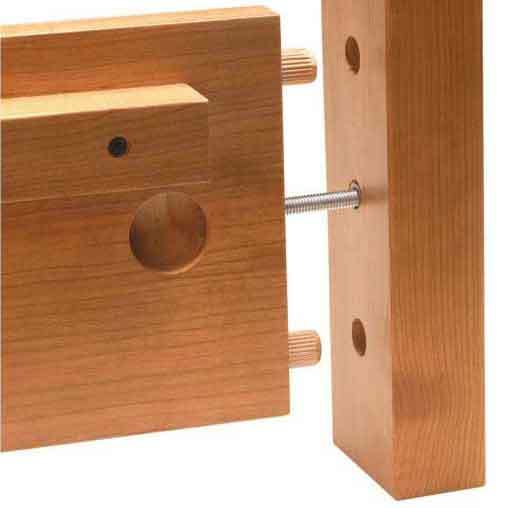 These T-braces are supported in the center by a solid wood leg with adjustable foot on the middle three slats. Standard beds have five 3″ wide slats; platform beds feature six 10″ wide slats placed at 3 1/2″ intervals and running the entire length of the bed. Frame and panel cases derive their main structure from the four solid wood upright supports which are joined by solid wood cross braces near the top and bottom of the case. A solid wood top is affixed to the frame and 1/4″ veneered hardwood plywood panels are integrated into the case sides and back. Because the panels are framed on all four sides with solid wood, the inset veneer panel is the ideal material. Were a solid panel employed, the expansion of the wood in high humidity could potentially crack and damage the frame. All sides, including the back, are completely finished. 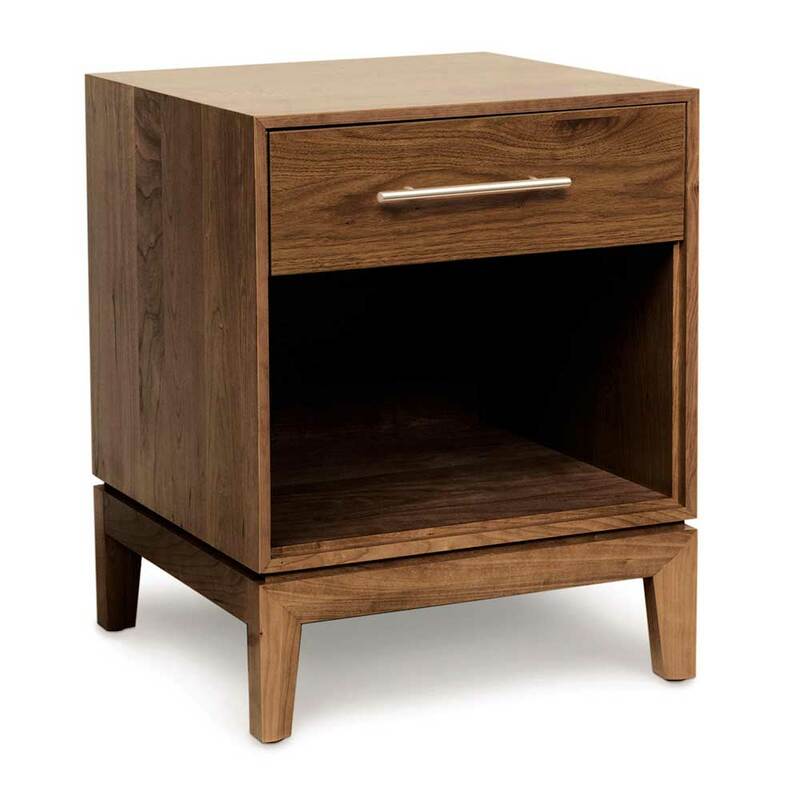 Modern collections under-mounted drawer glides that self close softly with a gentle push. In addition to a smooth easy operation these glides fully extend so items in the back of the drawer can be easily accessed. The Mansfield bed features a threaded machine bolt screwed into an embedded T-nut while two, non-glued wooden dowels align the bed rail with the headboard and foot board. This forces it into proper orientation and prevents twisting. The parts are joined together with a contoured washer and hex nut using the supplied wrench. The Catalina bed is assembled similarly, however, threaded bolts replace the wooden dowels. 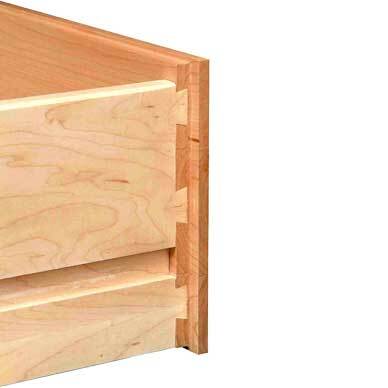 Bed slats consist of six 10″ wide X 1/2″ thick hardwood plywood boards that are supported by a solid hardwood 3/4″ plank centered under the slat and mounted perpendicular (T-braced) to the slat. 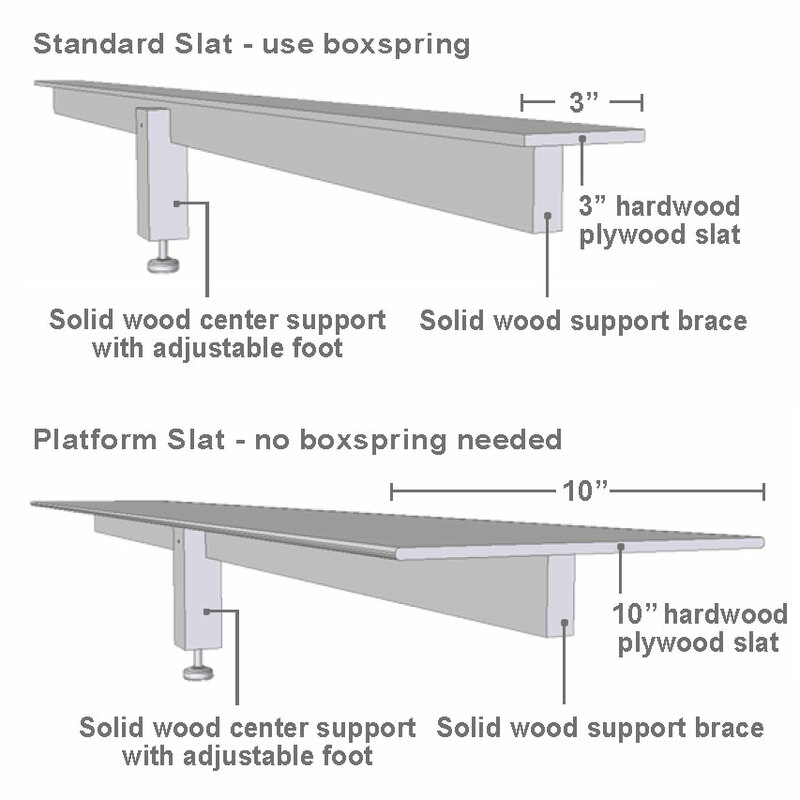 These T-braces are supported in the center by a solid wood leg with adjustable foot on the middle three slats. No box spring or additional foundation is needed. Forty-five degree miter construction refers to the angle in which solid wood tops and bottoms are joined to the solid wood sides creating a perfectly seamless border. The leading edge of the case is beveled creating a visually light look that belies the considerable heft of the construction.